In the late 1930s, having reached the pinnacle of success in Britain with such films as The Man Who Knew Too Much and The 39 Steps, Alfred Hitchcock was eager to make the trans-Atlantic crossing so he could play with Hollywood studio resources, what Orson Welles would soon call “the biggest electric train set any boy ever had.” As technically daring and adventurous as Hitchcock’s films often were, Hitchcock knew Britain’s facilities lagged far behind Hollywood’s, so soon after wrapping The Lady Vanishes (yet another feather in his cap), he and his closest collaborator, his wife Alma Reville, set sail for the U.S. to finalize a deal with independent producer David O. Selznick. Before he went on Selznick’s payroll, though, Hitchcock had time to make one last film back in England. This turned out to be Jamaica Inn, based on the novel by Daphne du Maurier, who also wrote the source novel for Rebecca, Hitchcock’s first American film. With Hitchcock halfway out the door, Jamaica Inn could have come across as strictly a work-for-hire gig, but it displays enough Hitchcockery to show he wasn’t as disengaged from the material as he would later claim he was. Named after an actual Southern England establishment favored by smugglers, du Maurier’s story is set in the early 19th century on the rocky Cornish coast, where ships are routinely lured to their doom by a band of cutthroats who lie in wait to kill any survivors and plunder their cargoes. Into this den of iniquity lands the recently orphaned Mary Yellen (Maureen O’Hara, who’s “introduced” in this film despite appearing in two others the year before), who comes over from Ireland to live with her Aunt Patience (Marie Ney) and Uncle Joss (Leslie Banks), Jamaica Inn’s landlord and the leader of the wreckers. First, though, Mary makes the acquaintance of Sir Humphrey Pengallan, the local squire and magistrate who sets “the finest table in Cornwall,” according to one of his dinner guests. 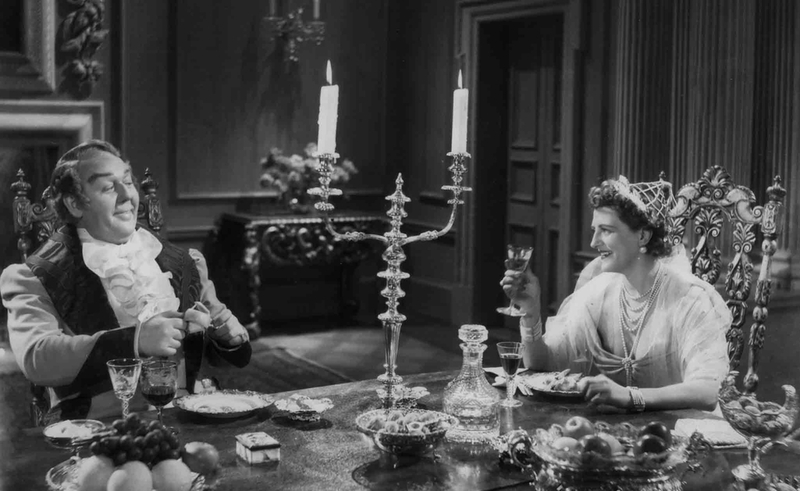 The role also makes a fine meal for star Charles Laughton, who produced the film with German expatriate Erich Pommer, who 14 years earlier produced Hitchcock’s first feature, The Pleasure Garden. Espousing a philosophy echoed by Danny DeVito in David Mamet’s Heist (and which briefly became an ongoing preoccupation in Roger Ebert’s Movie Answer Man column), Sir Humphrey patiently explains why he gets to keep the lion’s share of the booty from the raids. (This isn’t a spoiler: Hitchcock reveals early on who the real brains behind the brigands is.) “I know what to do with money,” the squire says. “That is why I must have it.” Later, while discussing fiscal matters with one of his servants, he points out that insanity runs in his family, which explains some of Laughton’s eccentric character choices. Then again, where Hitchcock’s treatment of his gallery of rogues is concerned, eccentricity is the order of the day: One whistles jauntily while going about his dastardly duties, while another is preoccupied by the judgment he’s certain they’ll face in the afterlife. In contrast, the film’s ostensible hero, recent recruit Jem Trehearne (Robert Newton, one decade before tackling the role of Long John Silver in Disney’s Treasure Island, which he subsequently reprised for multiple projects), is so personality-deprived that he sticks out even before he’s strung up by his cohorts when they suspect he’s been cheating them. Tellingly, he’s saved by the genuinely heroic Mary, who proves time and again she’s no mere damsel in distress. More resilient than Rebecca’s second Mrs. de Winter, Mary acts bravely and decisively on several occasions, but especially so in the sequence where she risks her own skin to foil the gang’s latest shipwreck attempt. What she can’t do is distract from the unconvincing model work, which Hitchcock does his best to cut around. No wonder Hollywood was beckoning. Daphne du Maurier found the screen adaptation of her novel extremely disappointing—she once called it “a wretched affair”—but that’s nothing compared to the substandard public-domain releases cinephiles have had to judge it by. Accordingly, Cohen’s presentation of its 4K restoration is a revelation, showing off the work of cinematographers Harry Stradling and Bernard Knowles in a way that hasn’t been possible for decades. Also included are the 2014 re-release trailer, a superficial video essay hosted by Hitchcock biographer Donald Spoto, and an informative commentary by film critic Jeremy Arnold. In particular, the latter untangles the film’s complicated development process, which required the services of multiple screenwriters, and Arnold makes the convincing argument that Jamaica Inn is “a minor film that is good, but not sensational.” One feature that’s conspicuously absent, though, is a subtitle track, without which it’s impossible to catch all of the witticisms Laughton hired author J.B. Priestley (who’s credited with additional dialogue) to pen for his outsized character.